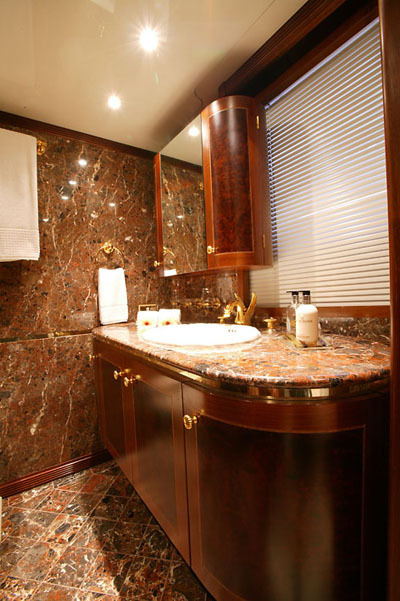 Motor Yacht MONTE CARLO is a luxury yacht built by the highly respected builders Amels yachts in 1988, having had an extensive interior refit and new decks in 2006/2015. 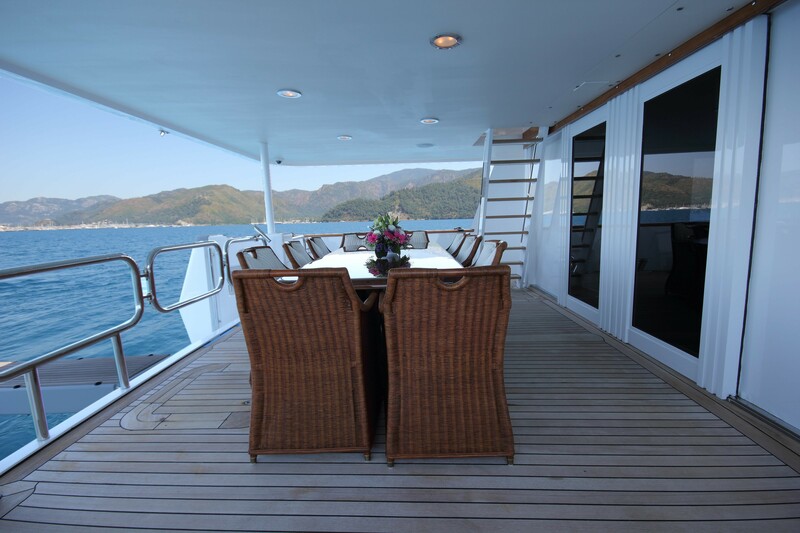 Charter yacht MONTE CARLO measures 40,25m (132.1 feet) in length and is able to accommodate up to 10 guests in 5 lovely cabins. 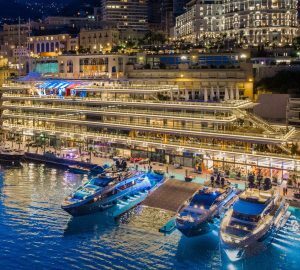 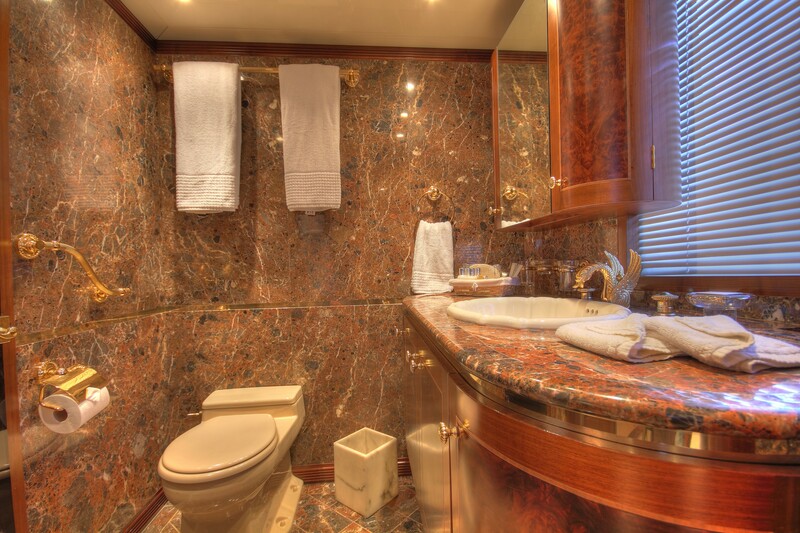 Motor yacht MONTE CARLO is well equipped with all the amenities for a luxury charter and is truly a showpiece of Continental flair. 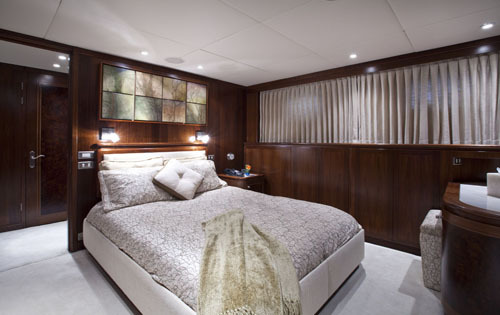 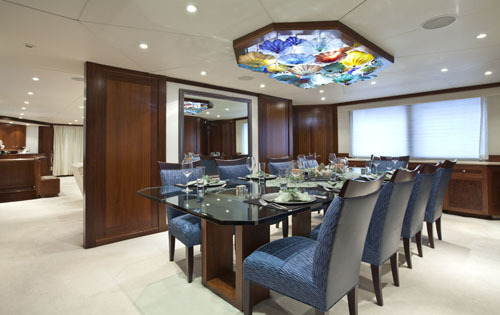 Charter yacht MONTE CARLO has an elegant, slightly minimalist interior, decorated mainly in neutrals, while clever flashes of colour and texture, artworks and sculptural furniture create interest and an atmosphere of understated chic, with credit to interior designer Claudette Bonville. 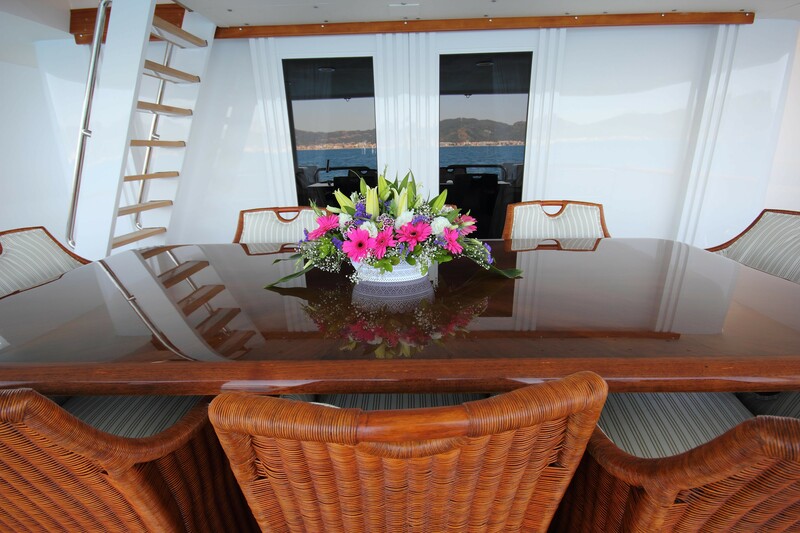 Luxury yacht MONTE CARLO has a large attractive main salon with plush sofas and good lighting, a bar area aft and a formal dining room further forward with seating for 10 guests. 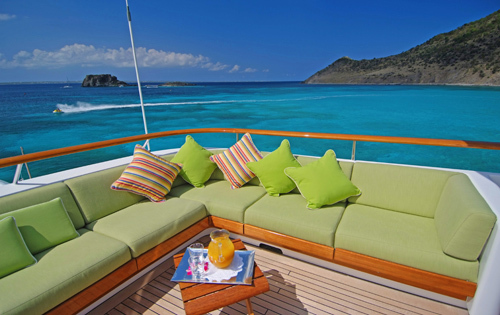 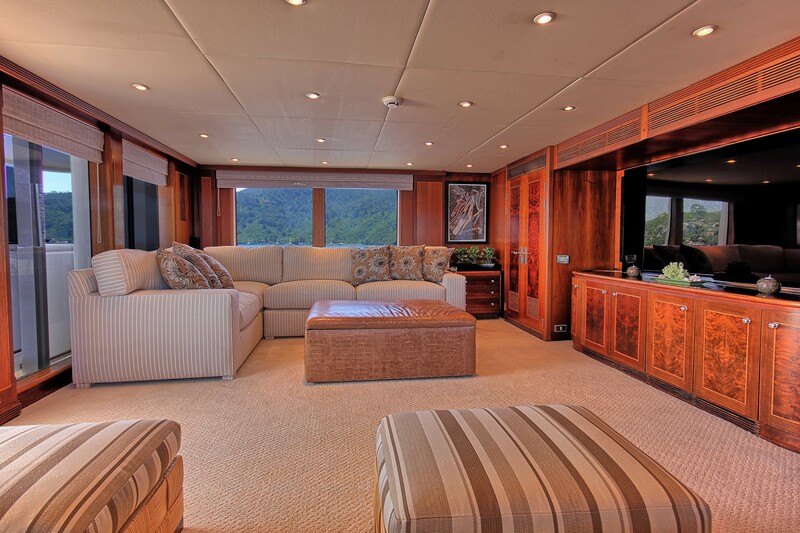 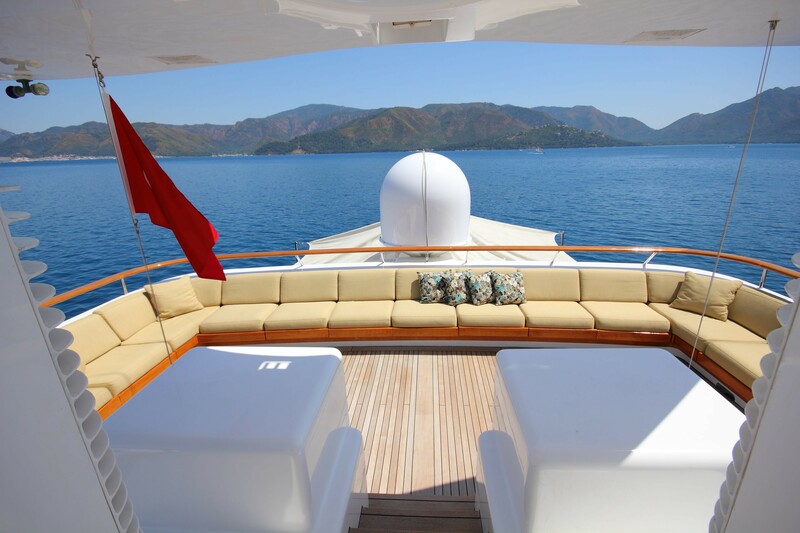 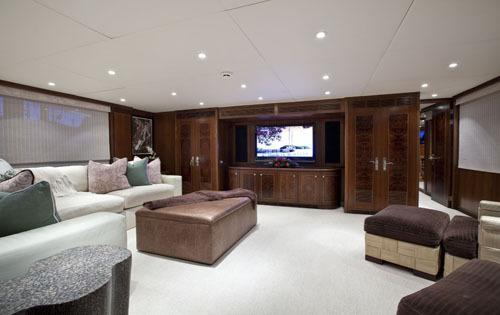 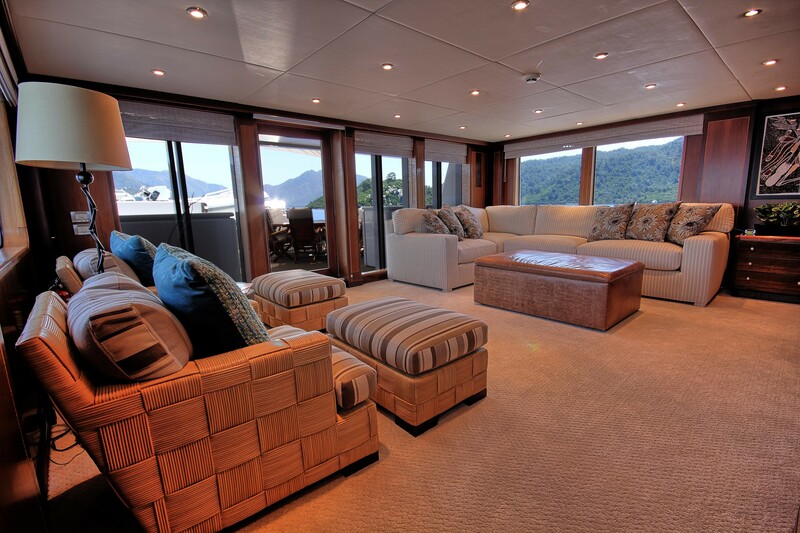 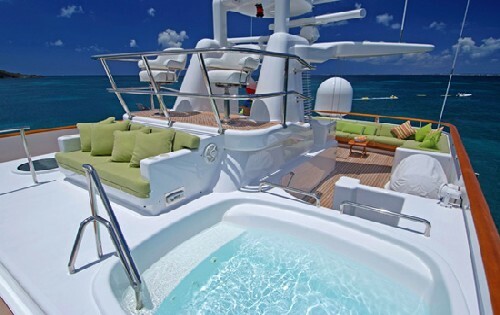 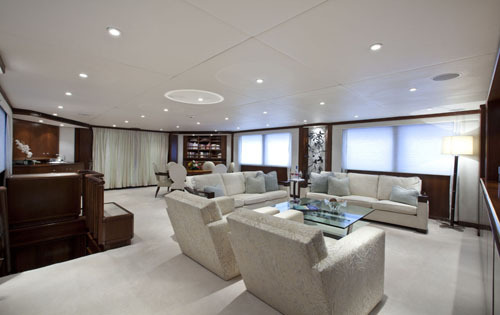 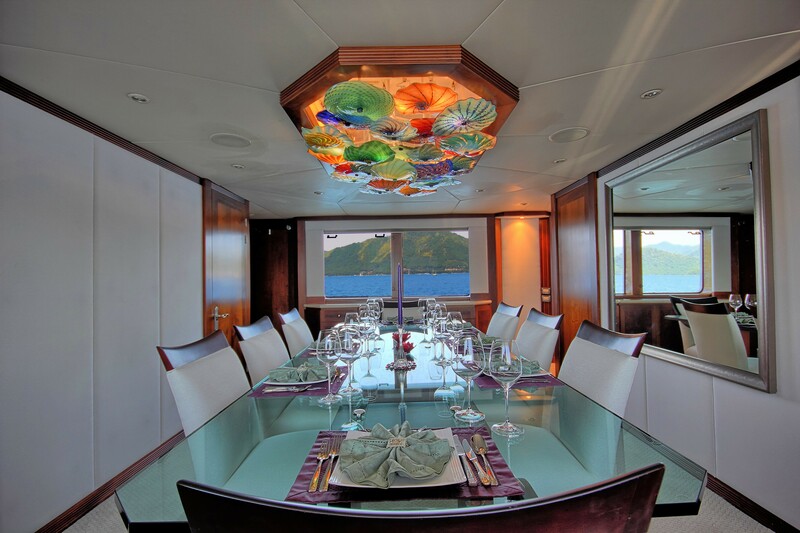 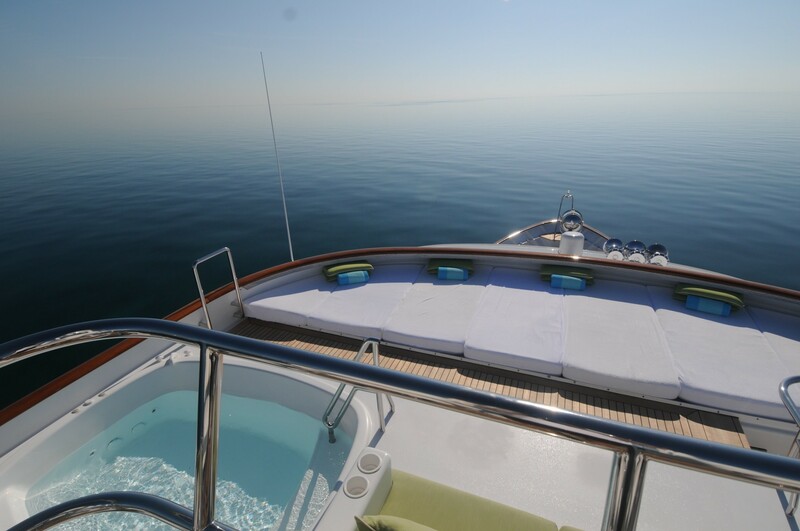 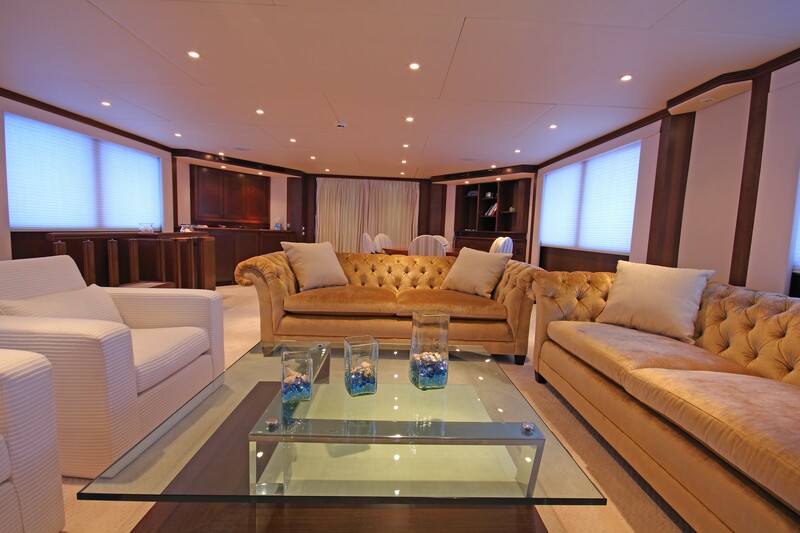 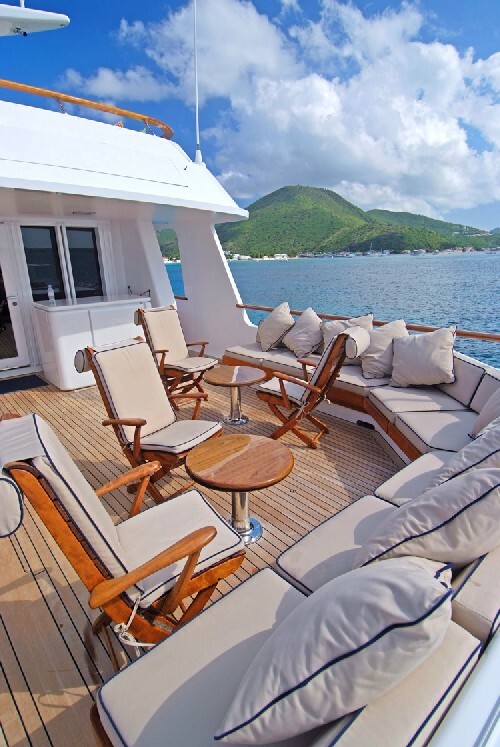 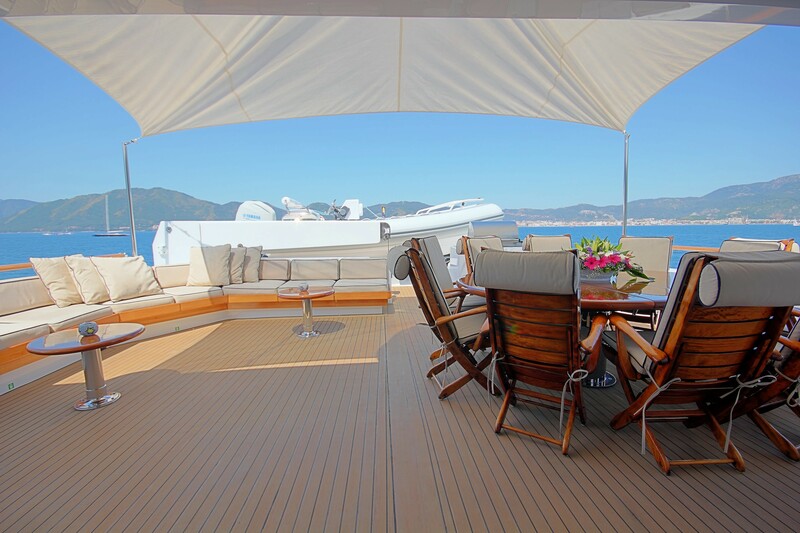 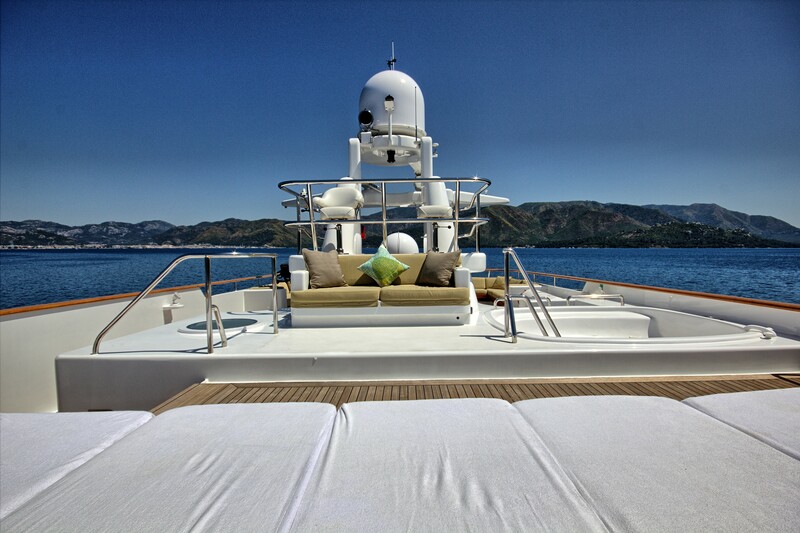 Yacht MONTE-CARLO also has an attractive sky lounge with further comfortable seating and a TV/ Entertainment Center. 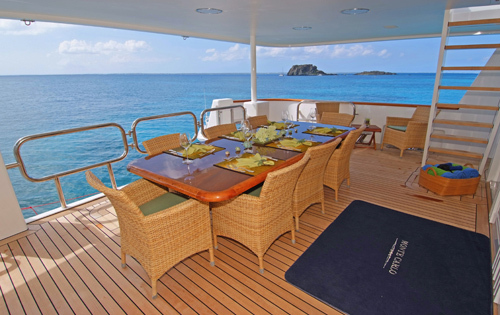 The MONTE CARLO charter yacht offers good deck space with a table and seating aft on the main deck for alfresco dining, and sofa seating forward. 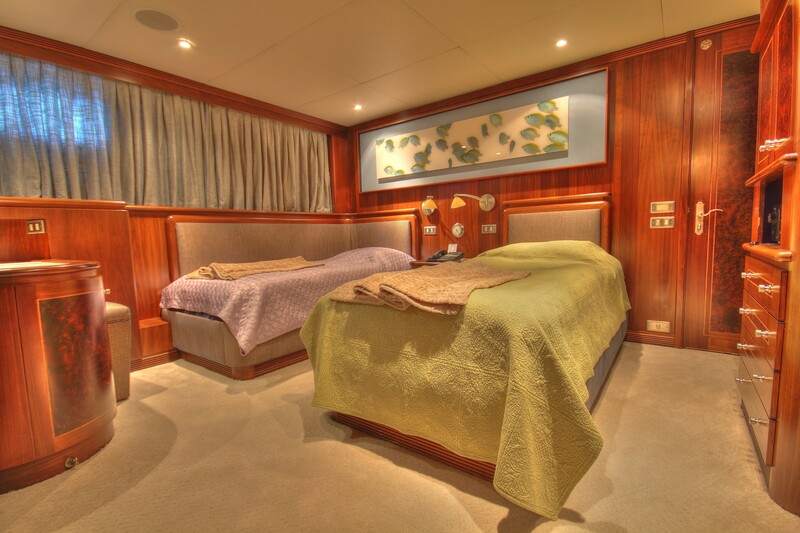 There is further seating and a large dining area aft on the upper deck, next to the sky lounge, and on the sun deck there is plenty of comfortable seating and sun pads, as well as a Spa Pool. 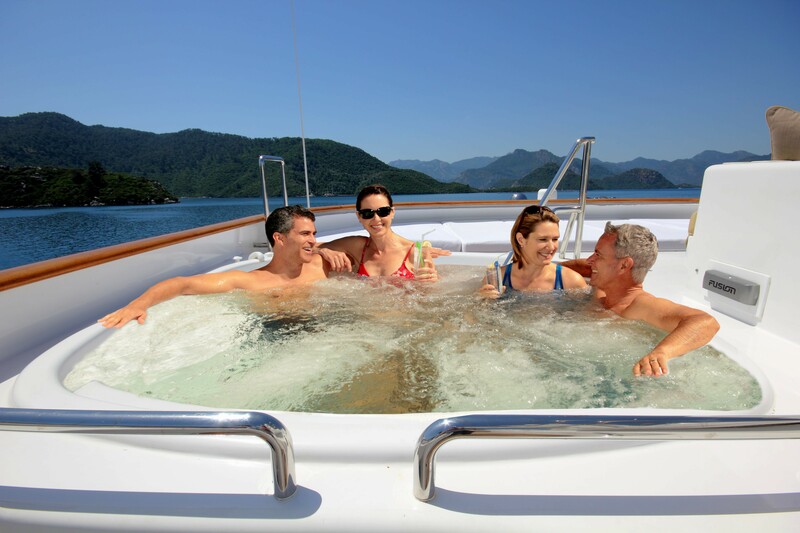 The swim platform gives you easy access to the water, so you can board the tenders easily or jump into the water to enjoy a fabulous range of water sports. 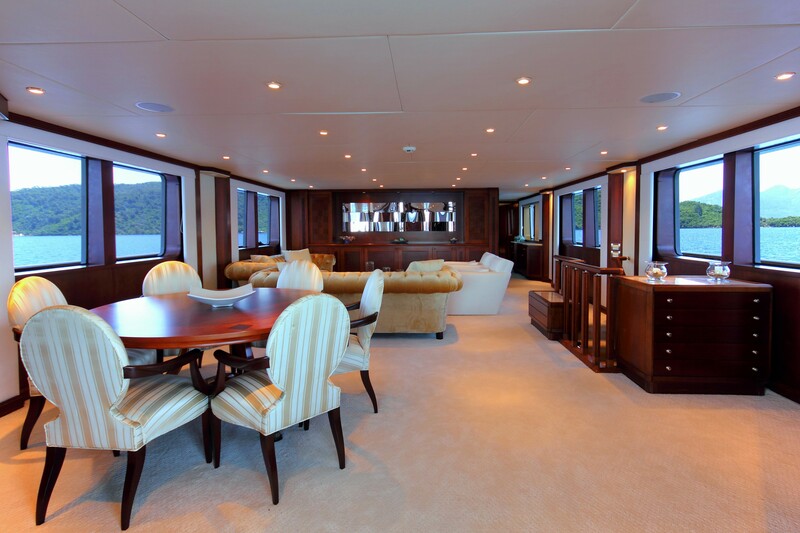 Luxury yacht MONTE CARLO offers a range of indoor amenities, including Internet/Wifi, TV, DVD and CD player with well stocked libraries. 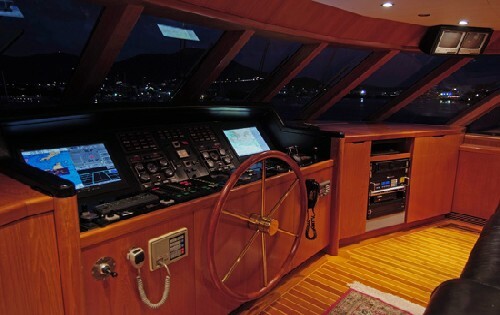 The motor yacht MONTE CARLO also offers a most impressive range of water sports, including: a 32 feet Intrepid tender in tow, rigged for fishing and with a back door for easy access to the water for diving, an 18 feet Novurania tender, 2 Yamaha 800cc SeaDoo's, Elliptical machine, Windsurfer (beginner’s board), 2 Kayaks (2 person), 2 Paddle Boards, Wakeboard, Slalom Ski, Water Skis (adult and child, Knee Board, Inflatable Donut, Inflatable Banana, Snorkel Gear, selection of Beach Toys, a Beach Canopy, Fishing Gear, Compressor & Dive Gear - 8 sets, and 2 mountain bikes. 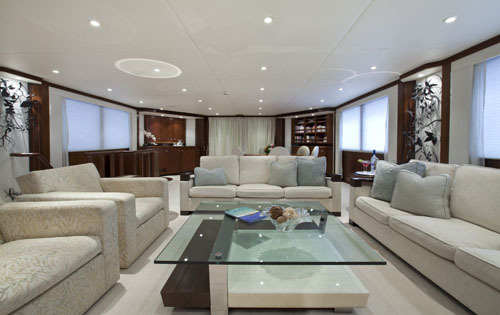 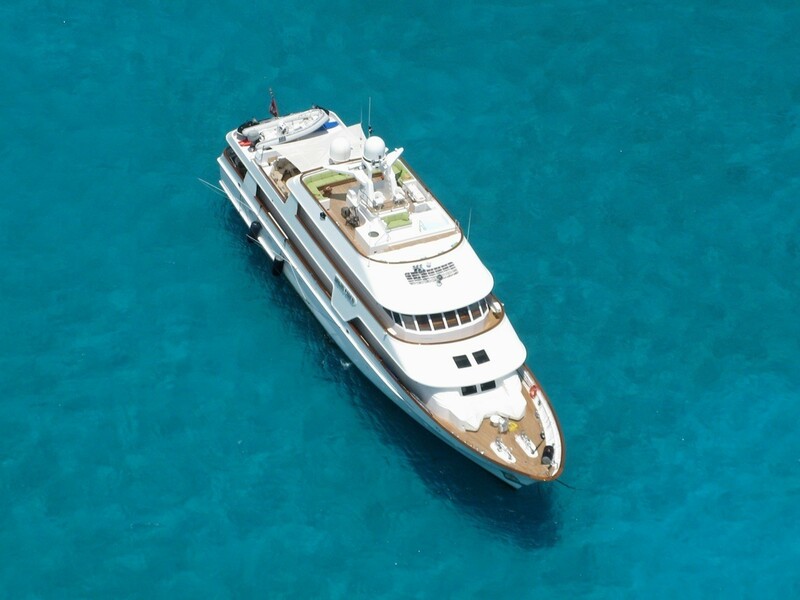 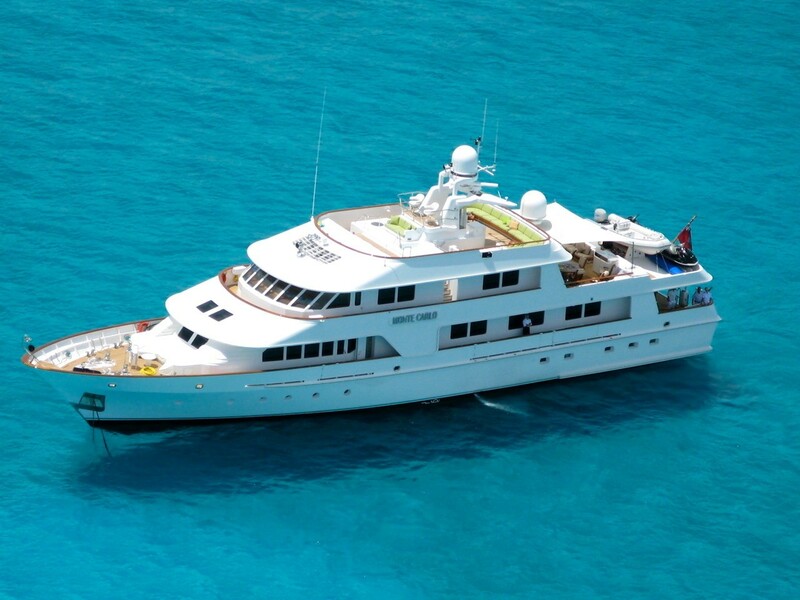 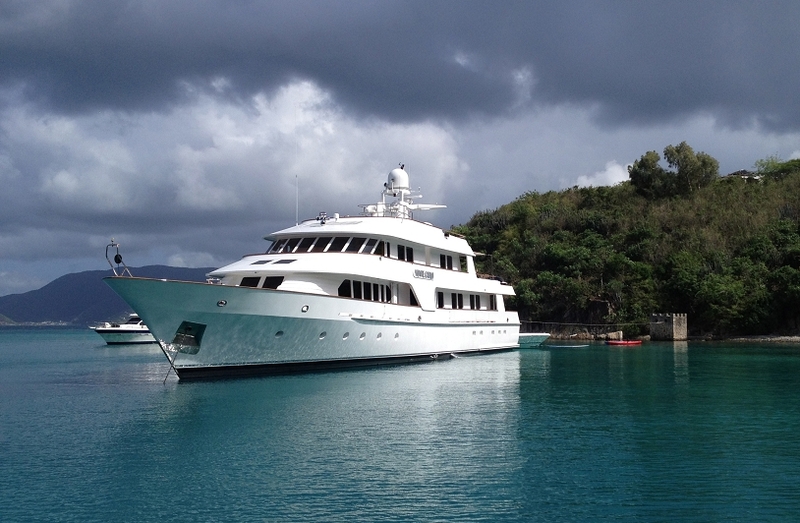 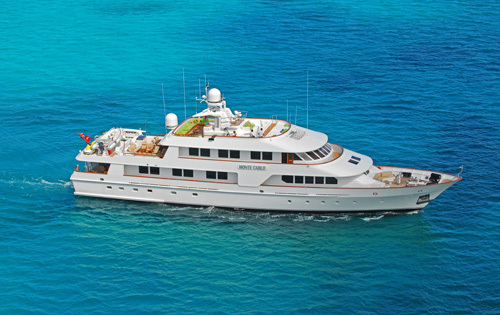 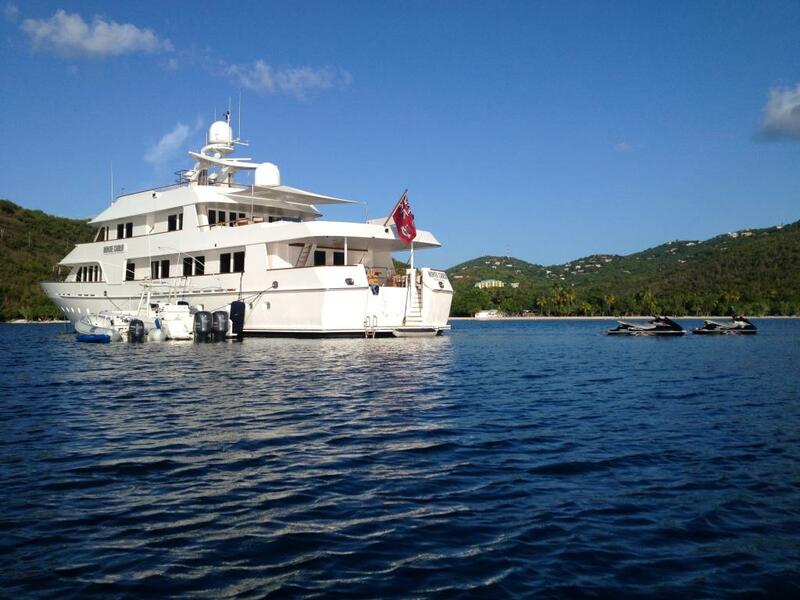 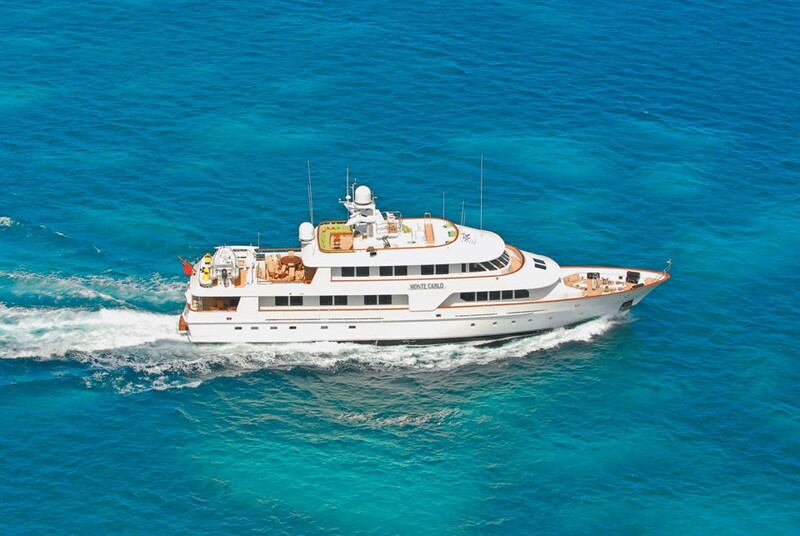 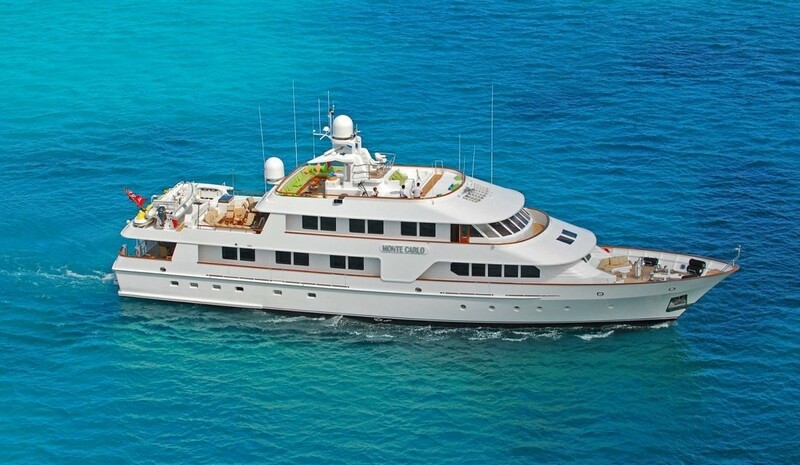 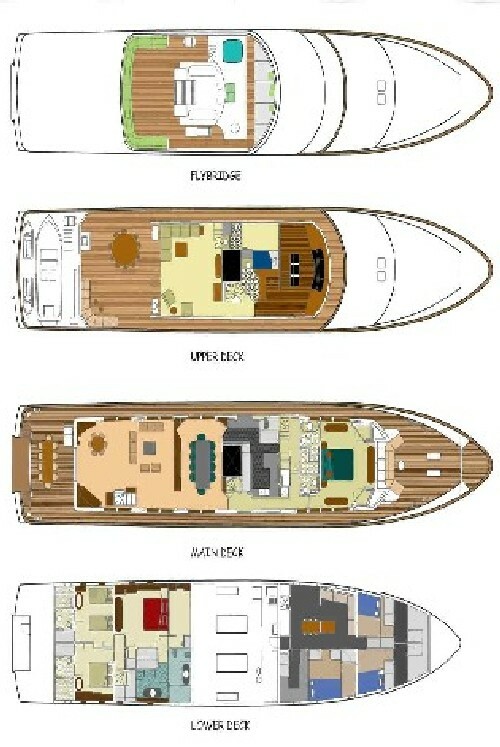 M/Y MONTE CARLO measures 40.25m in length (132.1 feet), with a beam of 8.06m (26.4 ft) and a draft of 2.36m (7.7 ft). 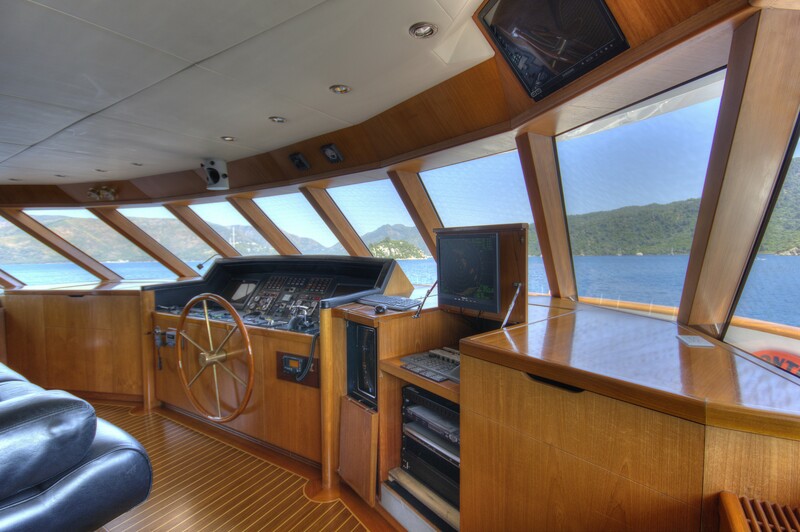 Motor yacht MONTE-CARLO has 7 crew members, and cruises at an average speed of 12 knots, reaching a maximum speed of 15 knots. 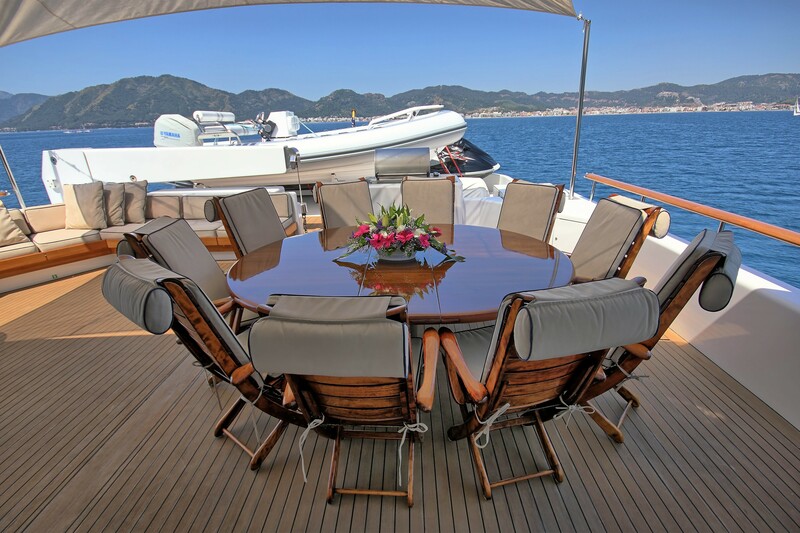 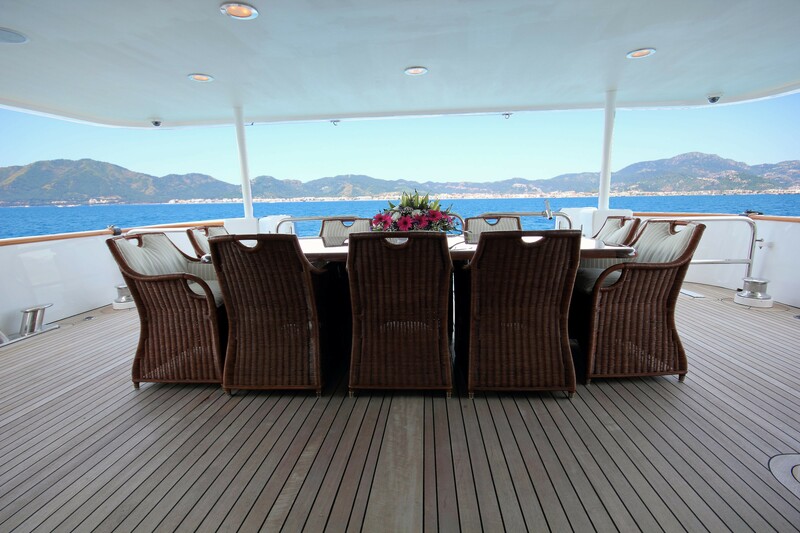 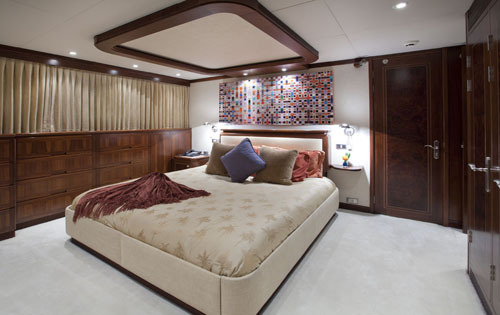 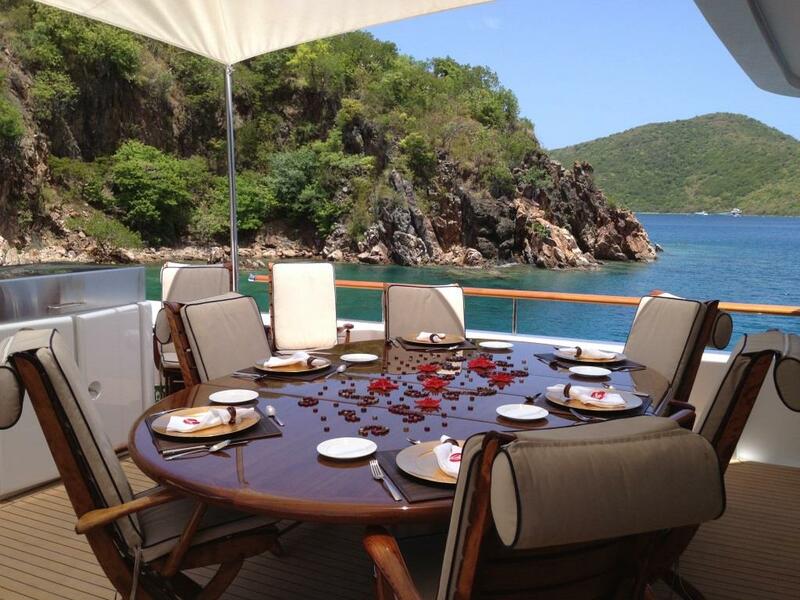 The MONTE CARLO motor yacht is able to accommodate 10 guests in 5 cabins. 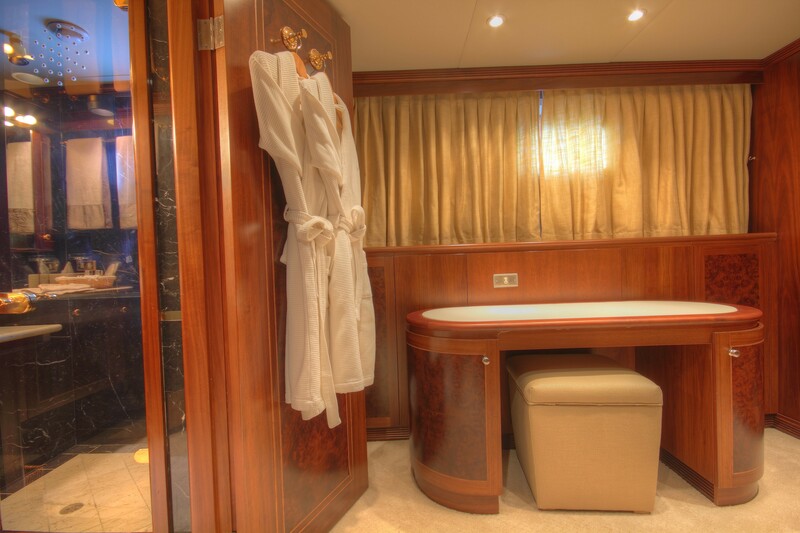 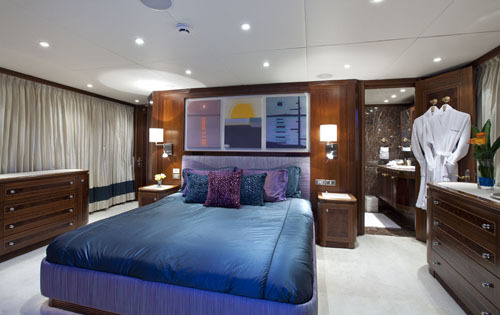 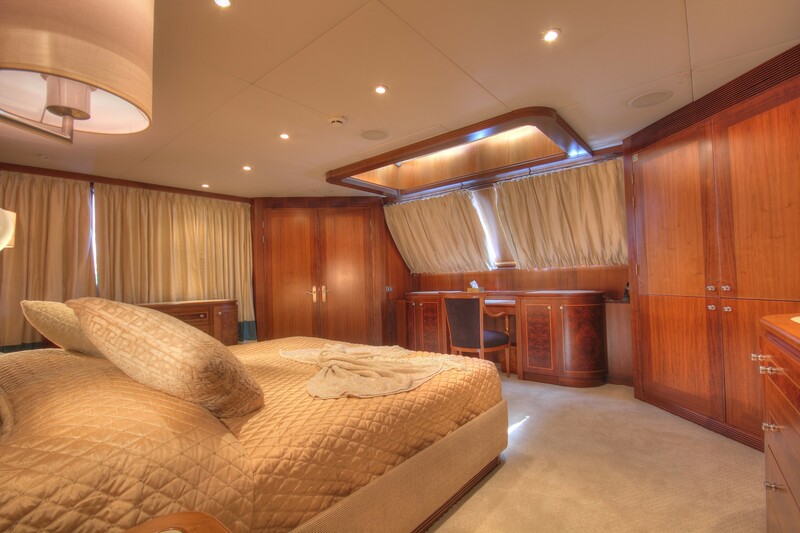 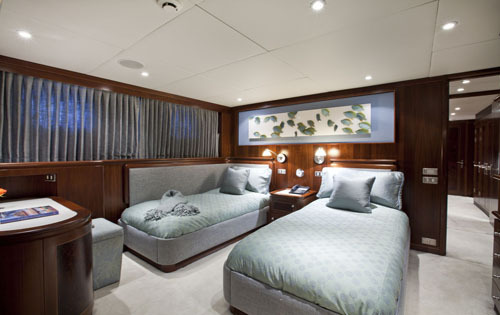 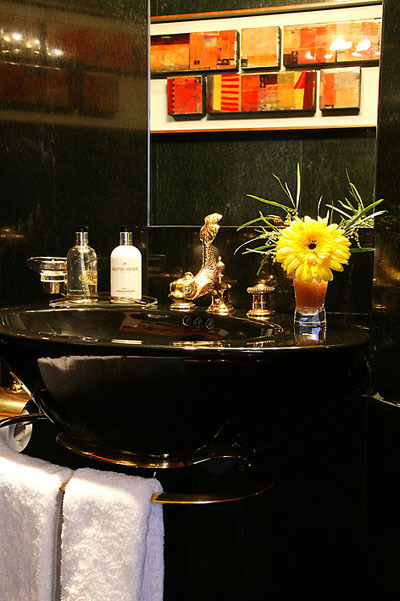 The Master cabin is located on the main deck and has a king berth, ensuite bathroom with shower. 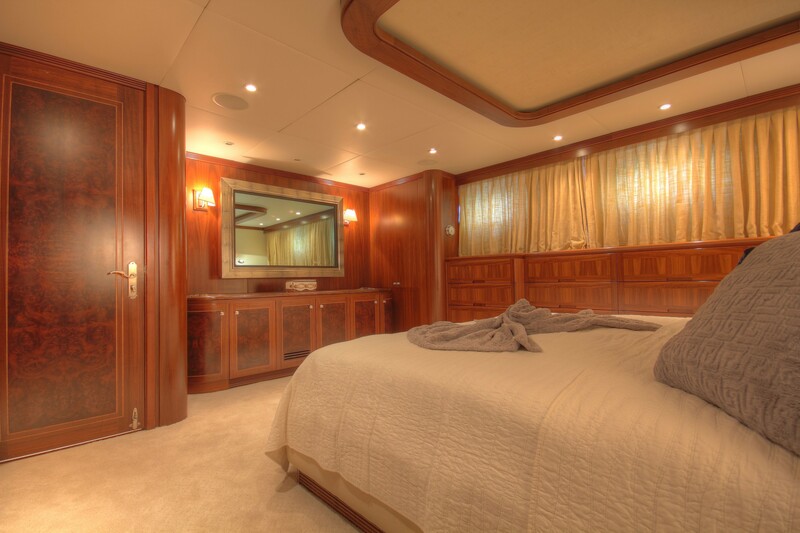 There is a second Master/VIP cabin, below deck amidship, with a king berth, ensuite bathroom with shower and bidet. 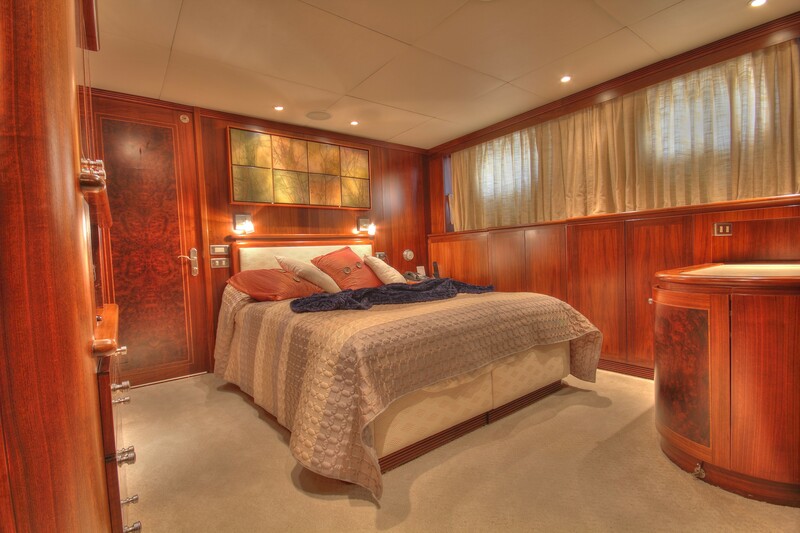 There is a queen guest cabin located on the lower deck on the starboard side with an ensuite bathroom with shower and a guest twin cabin on the lower deck to the port side with ensuite bathroom with shower. 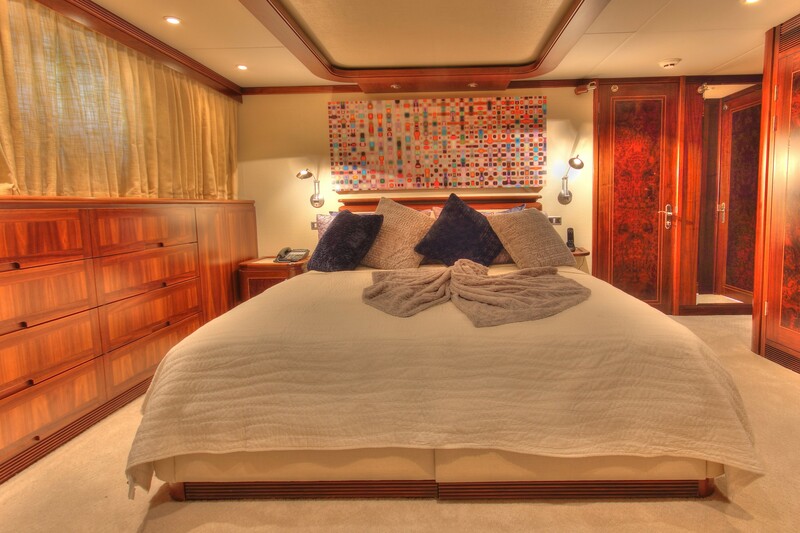 An additional cabin is adjacent to the master cabin with a double bed.